In what really isn’t a surprise (at least to me), the enviro-wackos at Aquifer Guardians in Urban Areas (AGUA) have filed a lawsuit seeking to stop the planned US 281/Loop 1604 interchange project, which would build the first four direct connectors at that intersection. According to an early Express-News report, AGUA claims that the Alamo Regional Mobility Authority (ARMA) didn’t kowtow to their demands, so they had no choice but to file a lawsuit. Overpasses: This would build overpasses on US 281 at major intersections. This proposal provides the least increase in capacity but has the lowest cost. However, as a toll-free option, funding would need to be found. Also, because the overpasses would increase travel speeds, many side streets and driveways would possibly need to be eliminated for safety and operational reasons. Expressway: This option would build a conventional expressway with six to eight main lanes and six lanes of frontage roads. The new expressway main lanes could be toll-free, tolled, or managed. Elevated expressway: This proposal would leave the existing 281 mostly in place as-is and would build four to six elevated expressway lanes above the existing lanes. 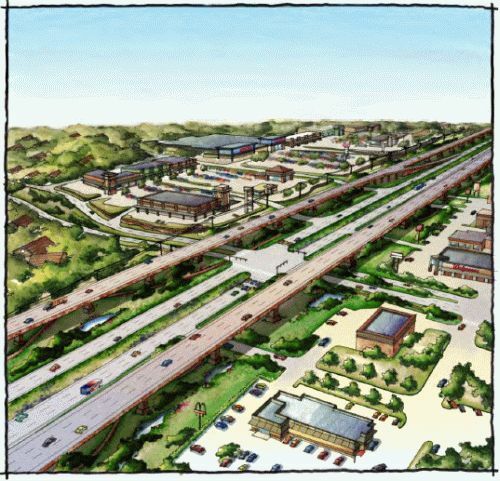 South of Stone Oak, the elevated lanes would be on each side of 281, much like the double-decked expressways downtown; north of Stone Oak, the elevated lanes would run along the west side of the existing lanes. Access ramps connecting to the existing 281 would be provided at strategic locations. Just as with the conventional expressway option, the new elevated lanes could be toll-free, tolled, or managed. In addition, any final proposal will also consider bus and park & ride facilities, pedestrian and bike improvements, growth and demand management, and Intelligent Transportation Systems (e.g. TransGuide). All of the options also consider reserving an envelope for a future high-capacity transit option, such as HOV lanes or light-rail. One option that had been carried forward previously– the overpasses coupled with additional expansions of Blanco and Bulverde Roads– is recommended to be dropped because of a number of factors. Each of the options to be carried-forward has strengths and weaknesses. The next phase of the study will further analyze each to determine which has the most pros and least cons. The meeting will begin with an open house from 5:30-7pm, followed by a presentation from 7-7:30 and small breakout group sessions thereafter. It will take place at the Summit Christian Center at 2575 Marshall Road (the same place where the Super Street meeting was held last year.) More information, including advance copies of the presentation and a map of the meeting location, is available here. What’s in store for your Loop 1604 commute? Here’s the gist of what’s being laid out, in a series of public meetings wrapping up tonight, for Loop 1604’s future. 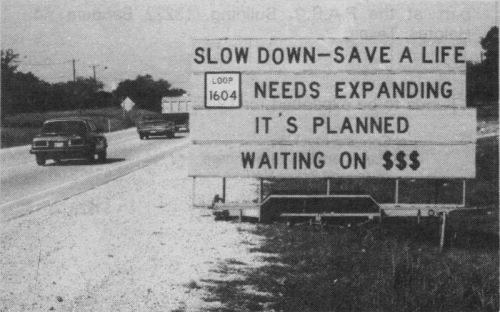 The problem, officials say, is that traffic demand in 25 years will be twice as much as what can fit on the highway today. The lanes can currently handle about 80,000 vehicles a day, but demand is 110,000 now and will surge to 155,000 by 2035. Buses and passenger rail. At best, this can meet 15 percent of demand when you consider that top-notch transit cities such as San Francisco, Washington and Boston snare about that much of the trips in those cities. Managing and improving traffic flows. This is done with engineering, like the super street idea, and behavior incentives that range from carpooling to staggered work hours and telecommuting. California enacted laws requiring large employers to use such commuting strategies but cut traffic just 3 percent. Adding four lanes to the highway. Since each lane can handle about 20,000 vehicles a day, that would do the trick. So you can see where the math leads. However, a dozen various community criteria will also drive decisions, and that produces a little more mix into the approaches. The top ideas on how to add lanes to almost half of Loop 1604 will be laid out in a series of three public meetings this week so officials can get input. With gas taxes strangled by decades of inflation, diversions and political inaction, toll fees and toll-backed bonds have emerged as a primary path to get some things done on the 37-mile stretch of highway. A previous study was derailed in 2008 after toll opponents and environmental activists filed a lawsuit in a federal court. The lawsuit in part called for Loop 1604 and U.S. 281 to be studied together, since they would have been part of an interrelated tollway system, and the judge seemed to agree. Monday, Valero Headquarters, Building D, One Valero Way. 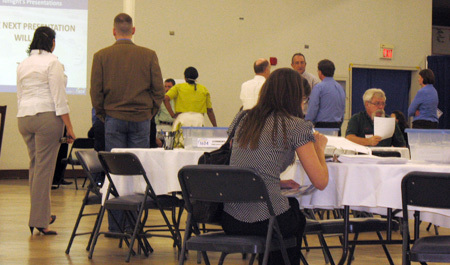 Tuesday, Live Oak Civic Center, Main Hall, 8101 Pat Booker Rd. Wednesday, Vale Middle School, cafeteria, 2120 N. Ellison Dr.
For more information or help, start out at More for 1604’s event page. After last October’s contentious MPO meeting where a motion to remove all toll options for US 281 and Loop 1604 was voted down, MPO policy board members voted to have a study done comparing the toll and non-toll options for 281. 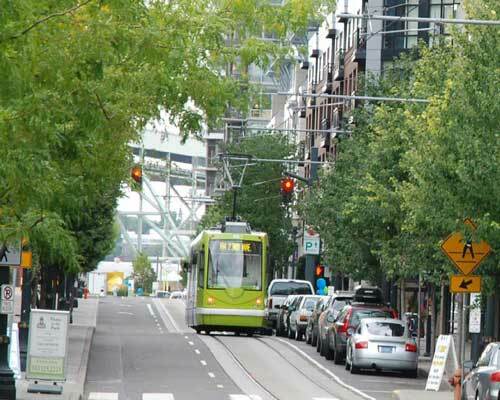 Streetcar from VIA Metropolitan Transit report (looks like it's in Portland). After starting the fiscal year by shaving $19 million in spending, including 330 jobs, the city is now being asked to kick in $17 million to build a two-mile streetcar line. That’s just part of the bill to buy streetcars and lay rails along Broadway and South Alamo Street by 2014. The county, VIA Metropolitan Transit and the federal government could also pony up to help pay what would be an estimated $90 million. City Council heard the pitch this afternoon. “If there was any sticker shock … council members mostly kept it to themselves,” the Express-News wrote. The city hasn’t made any commitments, at least not yet. At $45 million a mile, the price tag is quite a bit cheaper than, say, turning U.S. 281 out by Stone Oak into a superhighway, or, I should say, tollway. Ah, but already I’m talking apples and oranges. 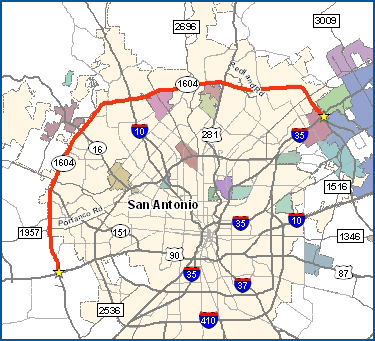 This quaint two-mile rail line wouldn’t be a wide commuter route helping connect San Antonio’s core to its fringes. Nope, unlike U.S. 281’s role as an artery for sprawl, the rail line, if done well, would be a magnet for compact living, working and playing. The idea is to drive some growth to the inner city, by creating a place where people would gladly leave their cars behind more often. Tourists would love it too. Nonetheless, critics and proponents will duke it out with such comparisons. And with so many angles on varying public and private costs, some visible and some not so visible, expect a debate that’s about as clear as mud.